Cryptocurrencies and other crypto assets have no shortage of doubters. Despite the rapidly rising Bitcoin and Ethereum price, over the past two years, Wall Street has continually bashed cryptocurrencies and warned investors to stay away. However, despite these warnings, cryptocurrencies have become a hot investment around the world, and the price of Bitcoin, as well as its lesser peer Ethereum, has become a front page news story on more than one occasion. Unfortunately, for Bitcoin’s most prominent supporters, the crypto story has started to unravel this year. The Ethereum price has plunged over the past week from a high of $1,372 on January 13, to $946 at pixel time. The cost of Bitcoin has fallen from a high of $19,000 in mid-December to less than $10,000 today. Bitcoin‘s volatility is its Achilles heel. As supports have tried to build infrastructure around cryptocurrencies, wild price swings have hampered these efforts. Also, the lack of regulation (a selling point) is causing regulators and authorities to hold back Bitcoin-based products. This was one of the reasons cited by the Securities and Exchange Commission as reasons why it was unlikely to approve an exchange-traded fund related to bitcoin soon. “We are not aware of a custodian currently providing fund custodial services for cryptocurrencies. In addition, how would a fund intend to validate existence, exclusive ownership and software functionality of private cryptocurrency keys and other ownership records? To what extent would cybersecurity threats or the potential for hacks on digital wallets impact the safekeeping of fund assets…” — SEC Letter. This isn’t the first time a Wall Street institution has called Bitcoin a bubble, but this damning indictment comes at a time when many investors are questioning if the cryptocurrency will even return to its previous highs. Goldman’s analysts note that “meteoric rise in a short time has dwarfed the rise seen during the dot-com bubble.” In fact, the bubble dwarfs anything ever seen before. 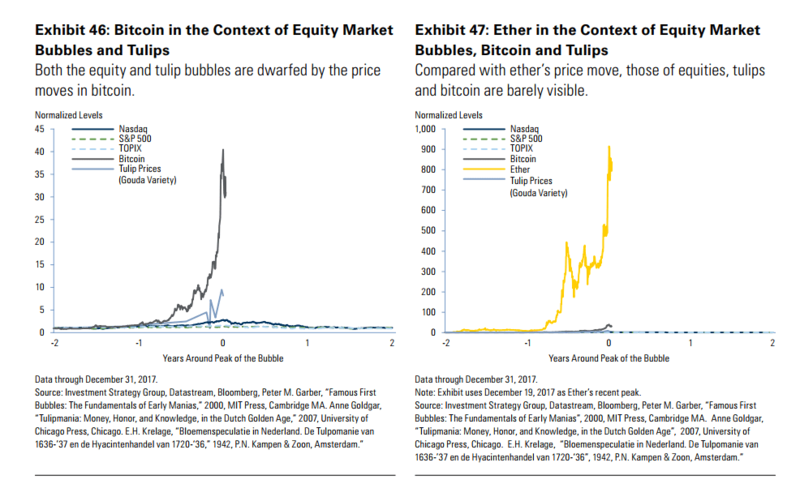 “We also believe that cryptocurrencies have moved beyond bubble levels in financial markets, and even beyond the levels seen during the Dutch ‘tulipmania’ between 1634 and early 1637” the report continues. Goldman’s investment management division does not like Bitcoin, and they think that Ethereum could be even worse. The Ethereum price was trading around $10 a year ago, at $943 today. As shown in the charts above, when compared to all other assets bubbles, including Bitcoin, Ethereum’s price surge has been nothing short of astonishing. One of the main bull arguments for Bitcoin and its peers is that cryptocurrencies could one day replace the US dollar as the global reserve currency of choice. With so much friction in the transaction process, Goldman sees this as unlikely. “Since the GFC” the report notes, “many pundits have put forth arguments about the end of the US dollar.” However, despite their global appeal “we view the unsteady cryptocurrencies as no match for the ‘Steady as She Goes’ dollar” the report concludes.